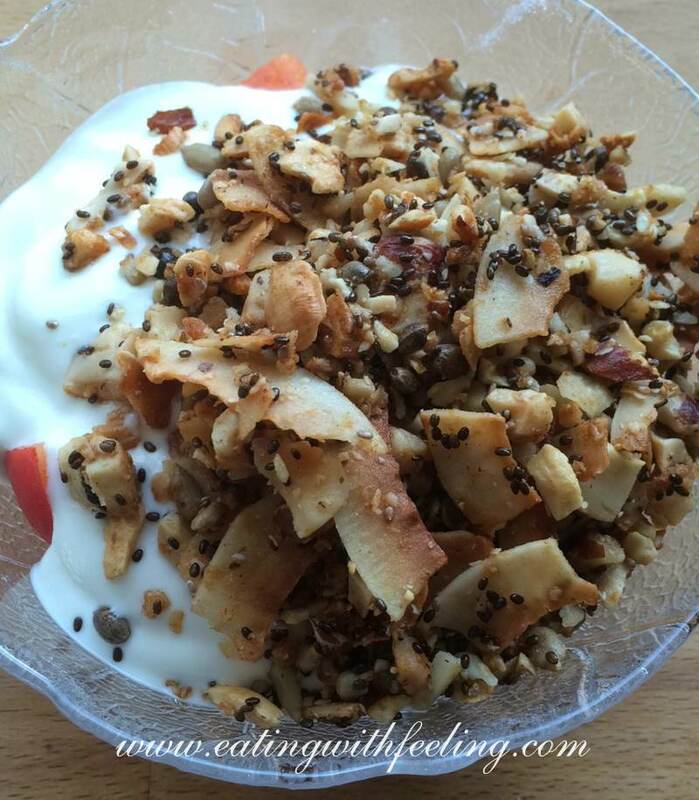 Before I got diagnosed with Celiac Disease I loved having a proper granola for breakfast. I tried various gluten free mixtures, but as soon as I realized I react to corn, rice and oats, too, I knew I had to rethink my granola. It took me several attempts to create a granola kit, which I am completely happy with. Why a kit? The thing is I don’t always have all the ingredients at home. And I love alternating it. The final mixture of nuts and seeds should be 400g. (Sorry, I tried to convert it to cups, but due to the different nuts my European mind couldn’t do it – please send me a mail, if you have an idea for this!) I always take 150g nuts for the basis. Sometimes I only use one sort of nuts like hazelnuts or cashews. Sometimes I simply take a ready made nut mixture or what I found in nature. another type of nuts, i.e. almonds or brazil nuts. After baking the mixture you can add dried fruits like raisins or mango stripes – which makes it absolutely delicious. One word of warning: the granola smells heavenly while it is warm, so the temptation is huge to just eat the whole lot. But as you can imagine the calorie content is really high in this granola, so rather enjoy it every morning and then only 2-3 tablespoons with a bit of almond milk or any other nut milk you like. Add the mixture of nuts and seeds to a blender or food processor. Pulse a few times to chop the nuts, but beware – don’t grind them into a fine meal, otherwise your mouth will be all dusty later! Add the nut and seed mixture and stir well to make sure it is all coated. Spread the granola mixture evenly on the parchment-lined baking sheet and bake for 20 or until golden-brown and crispy, stirring once after 10 minutes. Beware that you should stay near the oven at the end as the granola gets to dark easily! Remove the granola from the oven and stir it, so it stays loose. Wait for half an hour, add the dried fruits and store it in an airtight container. Dieser Blogeintrag wurde eingetragen in: Celiac Disease, In English, Recipes - Stichwörter: gluten free, grain free, granola. Bookmark setzen hier!.